Leslie Howard raises her winning trophy with Mariel Hamou of Duncan Ross. 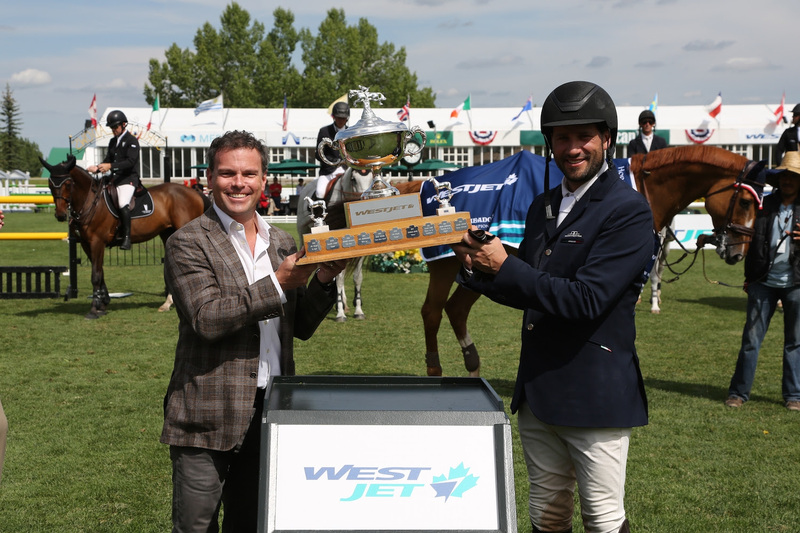 Calgary, AB, Canada –The Spruce Meadows ‘Pan American’ Tournament CSI 5*, presented by Rolex, continued on Friday featuring the Duncan Ross Cup 1.50m, as well as the WestJet Cup 1.45m in the Meadows on the Green. USA’s Leslie Howard jumped to an exciting win in the evening’s 1.50m aboard a brand new mount in the young stallion Quadam. Mexico’s Patricio Pasquel got the win in the 1.45m earlier in the day with his homebred gelding Babel. VP Communications, Creative Services & Community Relations, WestJet. 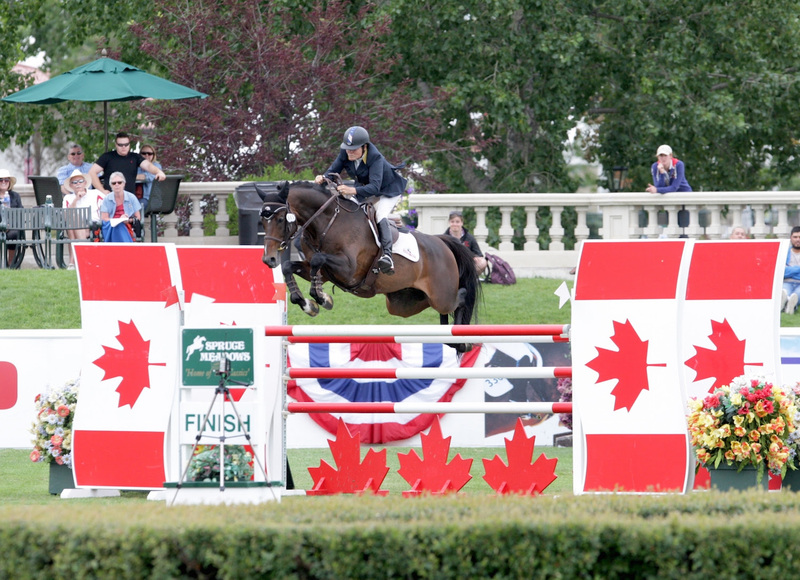 Photos © Spruce Meadows Media Services. These photos may only be used in relation to this press release and with photo credit. 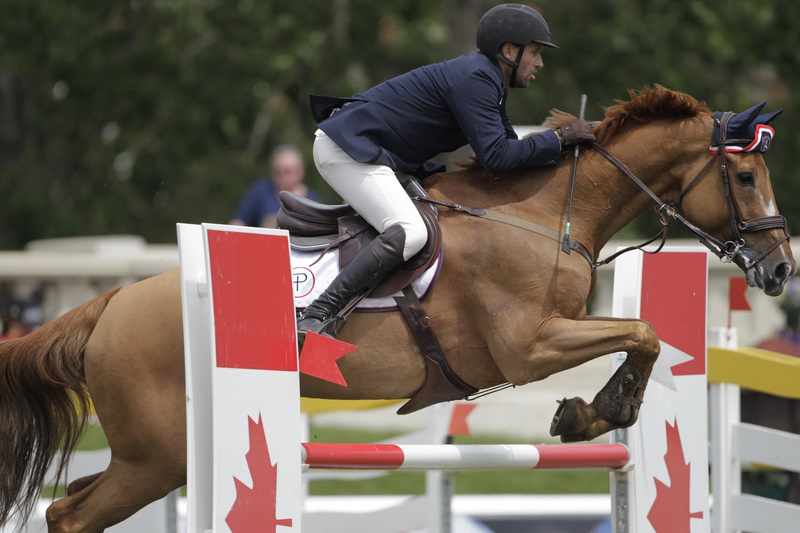 Based in Calgary, Canada, Spruce Meadows is the creation of the Southern family who built a Show Jumping complex at the foothills of the Alberta Rocky Mountains. It was in 1976 that the first Spruce Tournaments were held, with annual spectator attendances reaching over 50,000 by the end of the decade. Today, Spruce Meadows boasts one of the greatest outdoor equestrian venues in the world and offers an incredible experience for riders and fans alike. Spruce Meadows focuses on the organization and hosting of show jumping tournaments of unmatched quality for junior, amateur and professional athletes in a manner that reflects basic family values in a clean, green and welcoming environment that celebrates the horse and encourages the breeding and training of quality sport horses and the teaching and development of athletes. For more information on Spruce Meadows, please visit www.sprucemeadows.com.